Excuse the blurry picture but I was trying to move to the groove. We're still kind of in awe of what happened a few hours ago at Soldier Field. There's something about that grass, that field, that's special. Maybe because football legends play there and we actually got to pounce all over it? We lunged, we jumped, we high-kneed. 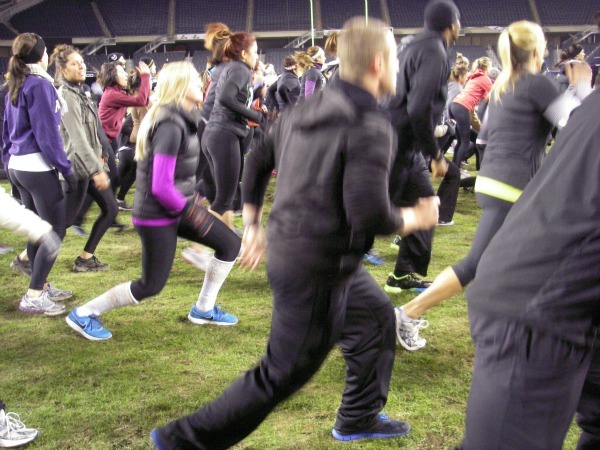 Sure, those moves will keep you warm on a chilly Chicago night (I shed my fleece a few minutes in), but they'll also give you a sampling of a Nike Training Club workout. 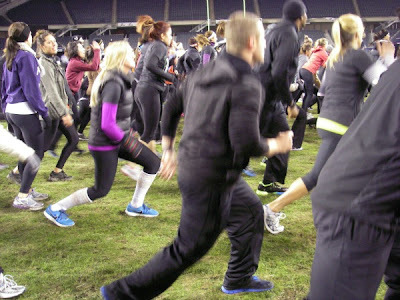 And with no mirrors and a few hundred of us packed onto part of the field, no one cared if you moved right when everyone else shifted left or if you kept bopping when the exercises changed. Or if you looked completely ridiculous attempting to one-legged squat (that move was tough!). Except for maybe your friends who got a good laugh (thanks Fleet Feet!) --but where else can you giggle through a workout and not have the instructor or classmates get annoyed by your banter? If 30 minutes is that awesome (you know I love a good workout), then I need to get with 2012 technology so I can sweat with NTC more often.